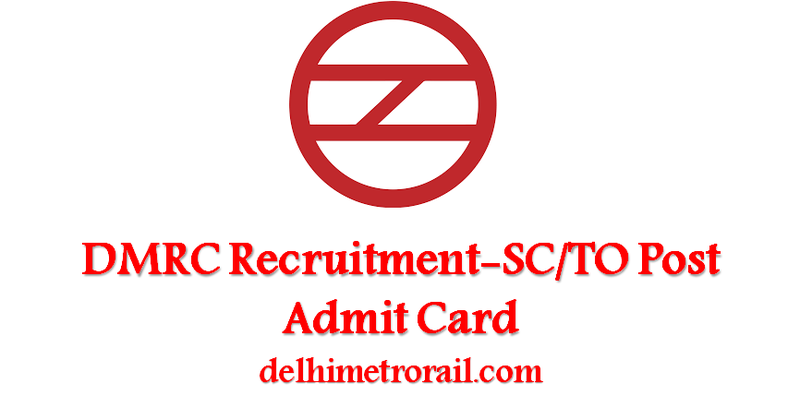 DMRC has issued admit card for written exam of Station Controller/Train Operator (SC/TO) post. The exam is scheduled to be held on 04 December. Eligible candidates can download the admit card from the official portal delhimetrorail.com. Delhi Metro will conduct written examination as a part of selection process for Station Controller/Train Operator (SC/TO) post. Details of the examination will be available in the admit card. Admit card shall be available only on the official portal of Delhi Metro 15 days prior to the date of Examination. Candidates are required to download the admit card in colour format only. How to download DMRC Admit Card? Candidates should note that admit card should be taken to the examination centre along with ID proof (if asked for). It is for the information of candidates that due to any exigency or technical issue, DMRC can change the schedule and will be updated on website only. Hence candidates are advised to remain in constant touch with DMRC website for updates. Written test for Assistant Manager (Civil/ S&T/ Electrical) will be held on 27 November and for other posts (except SC/TO) will be held on 18 December. Admit cards will be available on the official website only. About DMRC Recruitment: DMRC had invited applications from eligible candidates for recruitment to various posts in the month of September. Application portal was open till 15 October.